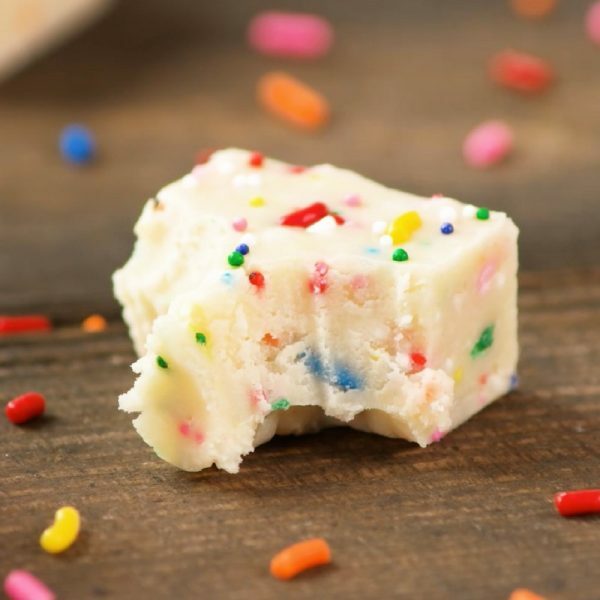 This creamy Cake Batter Fudge is an irresistible sweet treat with cake batter flavors. You only need 10 minutes of prep time to make this easy, no bake recipe! Perfect for a party or DIY gift idea. If you’re seeking the best white chocolate fudge, then look no further. The taste is sweet and chocolatey with cake batter accents. The velvety smooth and creamy texture takes you to a dreamy place, melting in your mouth. 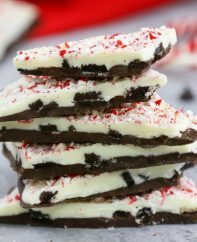 What I also love is that it’s a no-bake recipe that only takes 10 minutes to prepare, and is great to make with little helpers. You still need to let it chill for a few hours to solidify, but your time commitment is just 10 minutes. Are you ready? 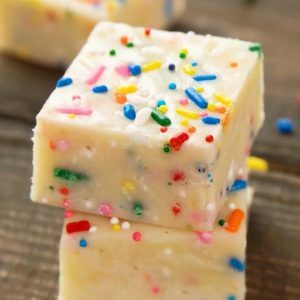 To make cake batter fudge, pour the sweetened condensed milk, butter and white chocolate into the saucepan on medium heat to melt. You can either use white chocolate chips or white baking chocolate here. Then whisk in the white cake mix and vanilla, stirring until it starts to bubble. This is important to make sure the cake mix dissolves, which helps the fudge to thicken later on. The last step is adding the sprinkles, and kids will love to help out with this step. Stir half the sprinkles into the saucepan mixture, and the rest in the pan. By the way, the best pan for this recipe is a 7 or 8 inch square cake pan like this one to get inch-thick pieces. If you are using a 9 or 10 inch pan, you may want to double the recipe. 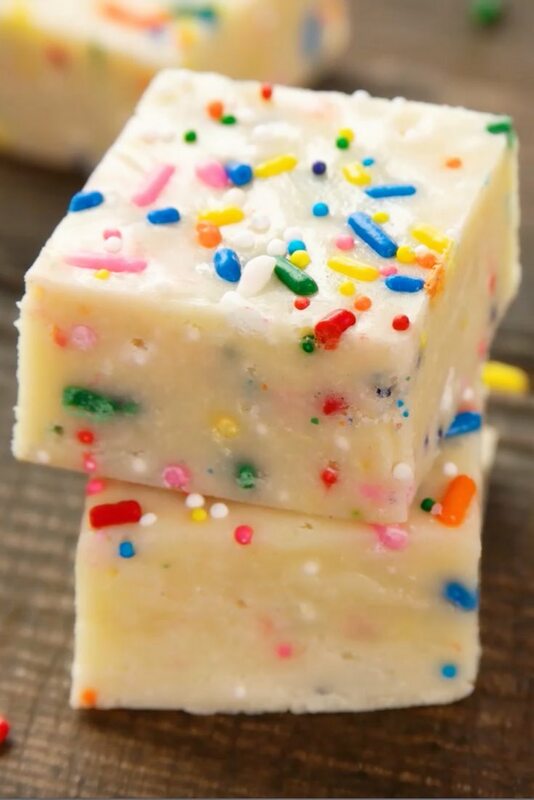 This easy Cake Batter Fudge is creamy and chocolatey, sweet and soft with colorful sprinkles. It's a delicious no-bake treat for birthdays, holidays or just everyday. Line a 7-8 inch square baking dish with aluminum foil or parchment paper. Set aside. Set a medium saucepan over medium heat. Add sweetened condensed milk, butter, white chocolate chips and stir until smooth. Add white cake mix and vanilla extract. Whisk slowly for a minute or two until it starts to bubble, and then remove from heat. 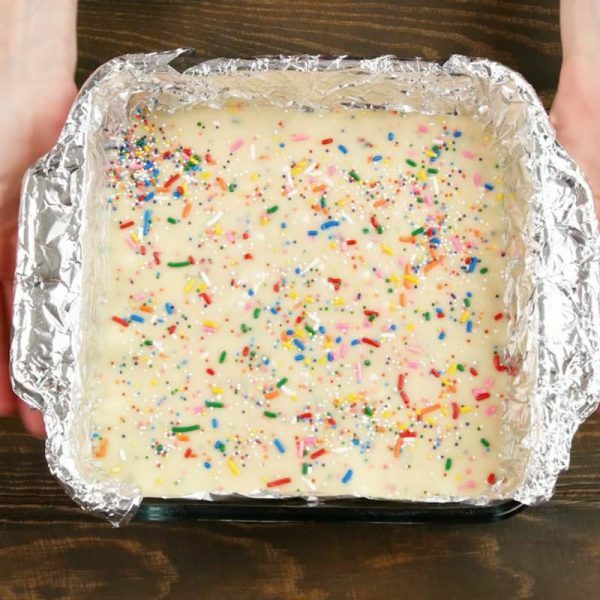 Stir in half of the sprinkles, and spread the mixture evenly into the prepared pan. While still warm, add remaining sprinkles across the top and press them lightly into the surface. Refrigerate for 2 hours to firm up. Using a rigid spatula, loosen the fudge from the edge of the pan, cut pieces and lift out for serving. Enjoy! Looking for more cake mix recipes? So easy and tasty. I added a little extra cake mix to thicken it more and set faster. By chance have you used any other flavor cake mix? I was thinking strawberry for Valentine’s. What is white cake mix? Hi there I am from SA please tell me in grams the condensed milk quantity. Sure Sabrina it’s 300mL or about 400 grams. Hope that helps! Can this be prepared ahead and frozen? Thank you! Hi Katy, good news is that it keeps for two weeks in an airtight container in the fridge 🙂 Happy holidays! 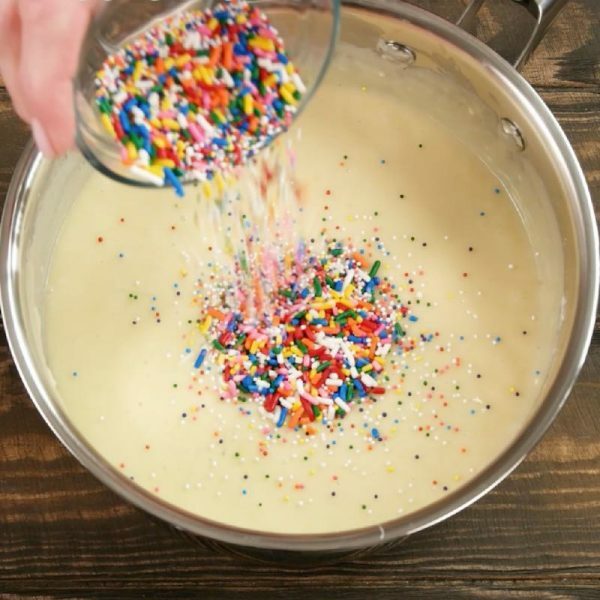 Could I use confetti cake mix and skip the sprinkles? 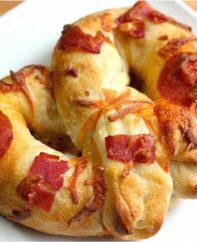 I love a good 10-minute recipe! This is so festive and fun! If using chocolate cake mix use chocolate chips instead of white. Do you think that this can be poured into little candy molds to set quick? Would it pop out as easily as plain chocolate if frozen? Hi Samantha, It’s pretty sticky fudge, so wouldn’t expect it to pop out. If the molds are flexible, it might work 🙂 Good luck! Can not wait to try this fudge!! I absolutely love white chocolate and fudge so this should be amazing!! Where is the video?? It says prep time is 5 minutes and cook time is 5 minutes.. so how is total time 2 hours & 10 minutes?? I made this last night and it won’t firm up enough for me to even cut it! It’s super sticky and I followed the recipe/instructions! ;( where could I have gone wrong?! Hi Chelsea, Thanks for your comment. Not quite sure what happened, did you refrigerate it to set? The recipe says 3/4 cup cake mix, but the video says 1/2 cup cake mix. which one is the correct amount? Hi Leah, 3/4 cup is the correct amount – sorry about that and enjoy! That is good food thank you bluegrass dot-dot……? Yes, you can. 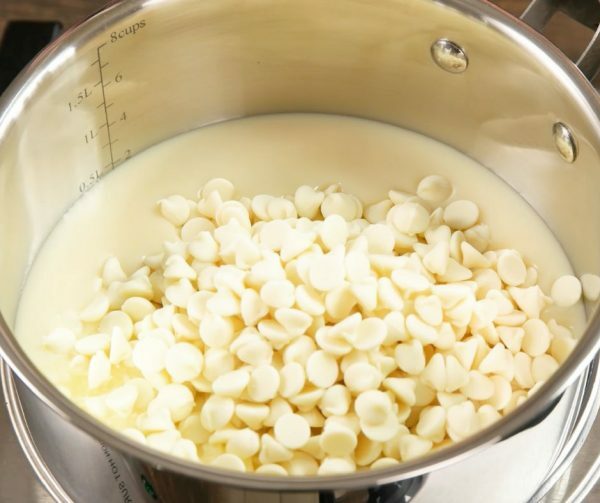 Place the mixture of condensed milk, white chocolate chips in a large microwave-safe bowl, microwave in 20-second intervals until smooth. Then add cake mix and vanilla extract, heat in microwave for 1 or 2 minutes. Stir immediately when it comes out. 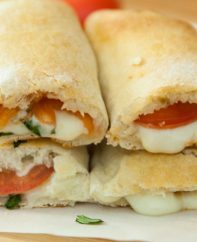 Easy to follow recipe and step by step guide for instructions.Can’t wait to try this with my grandchildren. Can’t wait to try! How many recipes can you get out of one box of cake mix? otherwise, what is everyone doing with the rest of the cake mix? Can’t wait to try it! How many recipes can you get out of a box of cake mix? otherwise what is everyone doing with the rest of the cake mix? Is there a way to make this without using cake mix? Like completely from scratch? Can i use red velvet cake mix? Hi Chris, Store in a cool dry place, but doesn’t need to be refrigerated unless it’s the heat of summer. Hope that helps!